I tried to "make" my game and found out the bytes were too big, so I recently separated my trainer sprite banks into two banks because a section was too big for the allowed amount of bytes. However, because I did that, everything after Professor Oak's sprites (in the bank) have been glitching up in odd ways. Decriment the accumulator's value by 1. I'm not too sure why we specifically use DE, or why we increment the bytes? Or why HL is commonly used? I also notice that the values are often loaded onto HL then HL loads onto another register, I was wondering why that is? Sorry for asking so many questions, I just want to understand as much as I can. Hahah. Thank you guys so much! I've been looking into Mateo's Red++ and trying to dissect what's going on for reference, I'm a bit lost unfortunately. I can't help with pokered specifically, but I can help with assembly language. Both jr and de are ultimately for the sake of saving space. "jp .SomeLabel" is a three-byte instruction, one byte for the jp opcode and two for the .SomeLabel address. "jr .SomeLabel" only takes up two bytes, because instead of an absolute address it stores a one-byte offset between −128 and 127. So you can't jump too far away with it. Anyway, hl is similarly special. For one thing, there are instructions like "add hl, bc" and "add hl, de", but no "add bc, de". Also, there are instructions that increment or decrement hl after using it. That's what "ld a, [hli]" means—it's equivalent to "ld a, [hl]" and then "inc hl". ; trainer pic pointers and base money. Each entry has two bytes for the trainer pic pointer and three for the base prize money. The entries are sorted in order of the trainer class constants. wTrainerClass holds the current trainer's class, but that starts at 1 not 0, so it has to be decremented to access the array. is used to copy an N-byte value from hl to de. hl can be read and incremented with a single instruction, but there's no "ld [dei], a" opcode, so it has to be incremented separately. And you do that N times. Basically the GetTrainerInformation routine is called after wTrainerClass has been set. It looks up that trainer in the TrainerPicAndMoneyPointers table and stores the info from that table in the wTrainerPicPointer and wTrainerBaseMoney locations. It also apparently gets the trainer's name, judging by the subroutine name "GetTrainerName"; and if it's a link battle, i.e. you're fighting a real person not an NPC, it just loads the pointer to Red's pic into wTrainerPicPointer and doesn't bother setting wTrainerBaseMoney. Actually, I can help you with this after all. Notice that the TrainerPicAndMoneyPointers table stores two-byte pointers. It has each pic's address, but not its bank. battle/core.asm:_LoadTrainerPic is where the pic is loaded. (Thankfully the pokered creators have given sensible names to everything so that's obvious.) Notice that it's hard-coded to use Bank(TrainerPics) (unless it's a link battle, then it uses Bank(RedPicFront)). So none of the pictures you moved to bank 9 will work, because it's trying to load the corresponding address in bank 8, and getting garbage. There are various possible solutions. 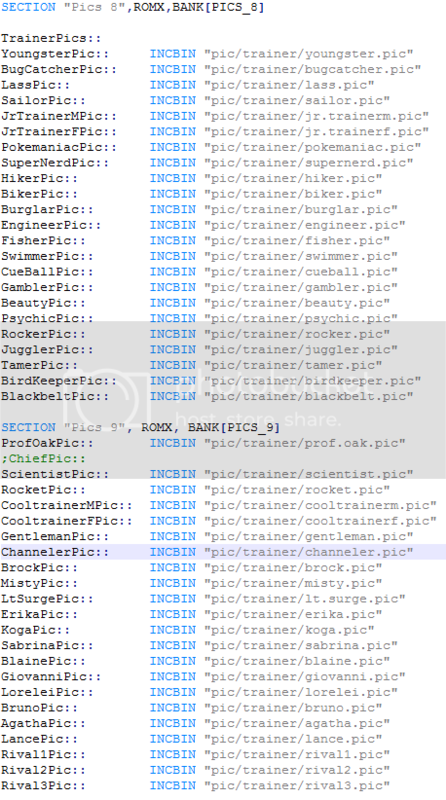 A cheap hacky one would be to make sure that (a) the trainer pics are stored in class order, and (b) only pics past a certain class ID are in bank 9. Which lets you do a simple test: "if [wTrainerClass] >= PROF_OAK then use Bank(TrainerPics2), else use Bank(TrainerPics)". Of course you'd have to put a "TrainerPics2::" label above your new trainer pics in bank 9, and translate that bit of pseudocode into appropriate asm. Red++ probably has a more flexible solution by now, like storing banks along with pointers in the TrainerPicAndMoneyPointers table (thus bringing each entry up to 6 bytes). This is more challenging to code; for example, you'd have to remember to change that $5 in the GetTrainerInformation routine to a $6. 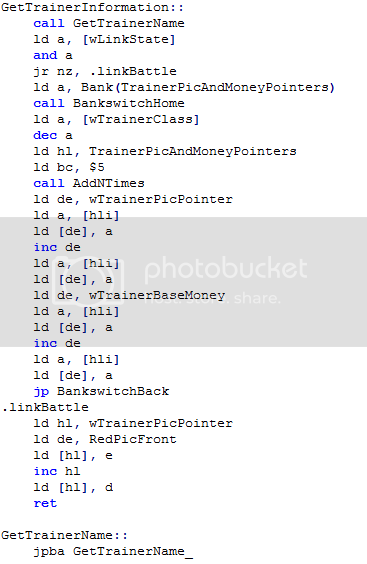 Edit: In fact Red++ has two separate tables, TrainerPicAndMoneyPointers for just the money (yeah, it should be renamed...), and TrainerPicPointers for the 3-byte pic banks and addresses. You can see how the GetTrainerInformation routine has been modified to deal with this, now that the pic-loading part has been factored out into LoadTrainerPicPointer. So this I kinda understand more. We subtract (or decrement) the value by 1, because decrement will always subtract by 1. Since we decrimented first, we'll order of operations it and put [wTrainerClass] - 1 parenthesis, because we want that done first. Load 5 onto bc, and now here's where I get lost. bc is arbitrary from the others, and I'm not quite sure what AddNTimes does. I think AddNTimes tells the last operand to multiply with the accumulator then add hl to it right? Or add the result of A the operand amount of times. Thank you so much for the JR lesson! It means it's not stored in a definite address but rather stores one byte somewhere random between -128 and 127? And we use this whenever we want to save space, gotcha! Sorry for all these questions I'm learning so much right now. I'm guessing the $5 used for the above code is used to define how many bytes an entry on the Trainer Pic and Money Pointers should have right? should be 5 bytes each because we defined bc as $5 in the function above? "ld a, [hli]" means—it's equivalent to "ld a, [hl]" and then "inc hl"
The "i" after hli means incriment, would that mean hld means decrement the result? Also uh, something weird to ask but why do they decrement the values and increment them? I've been seeing this a lot, I get what it does, but I don't understand why we do it in practice if that makes sense? Like I get the definition, but in practice, I'm kinda lost on where would the appropriate time be to inc or dec. I'm guessing it's when we want to define how many bytes we should give a label like TrainerPicAndMoneyPointers? This is my thought process on this pattern. increments the de by one so now it's de + 1. Didn't we increment de after we put a's value onto it? So if the initial value of a would be 0, wouldn't de be 2? We go onto the next part where we load a onto de, which I think is the same value now. ld a, [hli]    ; HL + 1 = A (Loads the value of HL into A, increments it. Assuming HL is 0 and it loads onto A, wouldn't it mean (HL = A) + 1? Or is it HL+ oldA +1 = new A?). If former A = 1, assuming HL is 0, if latter A = 2.
ld [de], a ; loads A onto DE, which is used to be 2. If it's (HL = A) + 1, assuming HL is zero, the A would be 1, wouldn't that cancel the increment that we put on DE because DE is 2? Meaning since we loaded A onto DE, the 1 value would become the DE value right? For the former (HL = A) + 1, this version loads the hl to the a first then increment. Why do we put a lower value onto DE if we want to increment it? So I'm guessing it can be seen as HL+oldA + 1 that way A would be 2 and DE would be 2, and could be translated as 2 = 2 (A = DE)? If this is the case, it's loading the same value into itself and I'm not sure why it's done like this. Is it to keep track? ld [de], a; load a onto de. If former DE becomes 1, if latter the DE has same value as A even before loading, assuming HL was 0. DE = A, 3 = 3. Since we load HL first onto A, I think it can be (HL -> A) + 1. However, because there's no ld [dei], a code, I'm assuming it can be the latter, where a goes into de and gets increased by every step. I'm so sorry, I'm very new at this. Thank you for being amazingly patient! under the ld de, wTrainerPicPointer. I'm going to use this new knowledge to translate both of the codes to the best of my ability. ld [de], a ; ld [dei], a, right? ld [hl], d ; Why separate e and d I wonder? Do we increment hl after e, then load d onto hl? ld a, [hli] ; get first byte of pointer - Mateo wrote this, I don't know what this means. ld a, [hl] ; get last byte of pointer? - Mateo wrote this, I don't know what this means. add_pic YoungsterPic ; Uses the add_pic macro from data macros. I was also wondering what data macros do and what they're useful for. I think it's probably something that pastes the function or code of what's written down onto where the code calls for the macro right? It's faster but takes more bytes or something? A close friend told me that's what macros do in other languages, but it works the same way in Assembly right? I do want to try out a safe way that Mateo has done to have the pointers reworked that's kinda flexible, so that way I don't run into too many bugs if I were to put say, more trainer classes in. 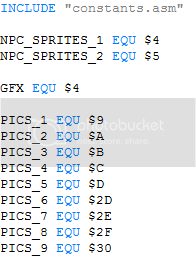 However, if I use the TrainerPics2 method, and if I hypothetically were to make sprites that were bigger than 2 banks, would I also the TrainerPics 3 label along with it? Would that cause problems along the way? If so, how would I prevent it? Aw man, I hope I'm not asking too much. I really appreciate your help! ld d, a ; de contains pointer to trainer pic, - written by the author of Pokered, I'm guessing d is the first byte that's why there's a plus 1? jr z, .loadSprite ; If it's a zero, not in link state, we will load the sprite. But I'm not really sure where to start to approach this. I really appreciate your tutelage Rangi! Seriously, thank you so much. This is really helping me understand more about ASM. I'm guessing the AND is there because they needed to have a Z flag checked. Then look at the definition of AddNTimes in home.asm. that's setting hl to the address labeled TrainerPicAndMoneyPointers. Then since the data after that address is in chunks of 5 bytes, and we want the chunk of the ([wTrainerClass] − 1)th trainer, we add 5 to hl ([wTrainerClass] − 1) times. It might help to rephrase things, Don't say "we load in wTrainerClass to the accumulator," say "we set a to the value at wTrainerClass". Or instead of "we load TrainerandMoneyPointers onto hl", say "we set hl to TrainerandMoneyPointers". (Note the difference between loading the value at an address into a one-byte register, and loading the address itself into a two-byte register.) Personally when reading code to myself I prefer shorter names like "a" instead of "accumulator", since we have finite working memory, and phrasing like "set this register to that value" echoes how modern programming languages work. Thank you so much for the JR lesson! It means it's not stored in a definite address but rather stores one byte somewhere random between -128 and 127? Well, it's not random, it's a precise value. Say that the jr instruction itself is at address 1230 and you want to jump to SomeLabel which happens to be at address 1240. Then 1240 − 1230 = 10, so it would be encoded as $18 $0A: $18 is the opcode for "jr N", and $0A is hexadecimal 10. Correct. But careful with that "because". The $5 in this one routine has no effect on the "dw YoungsterPic, money 1500" declaration. Rather, they chose to use $5 there because "dw YoungsterPic, money 1500" was already 5 bytes. "dw" declares a two-byte word, and "money" is a macro that ends up declaring three bytes to encode the money value in an odd way. I'm not sure what you're talking about here. They don't decrement hl or de in GetTrainerInformation. In general, they might inc and then dec if they need to get the value at the next address and then keep using the previous address. and that's it. And you can only access memory in certain ways, like "a = memory[h*16+l]". (Oh, and for convenience you can define "labels" like "TrainerPicAndMoneyPointers = 0x5914" just so you can say "a = memory[wTrainerClass]" or "hl = TrainerPicAndMoneyPointers" instead of "a = memory[0xD031]" or "hl = memory[0x5914]".) And you also have a limited file size for the program itself. C would be a good language to learn if you want some convenience of a higher-level language with the low-level memory model of assembly. No. "ld a, [hli]" is equivalent to "ld a, [hl]; inc hl", which in pseudocode is "a = [hl]; hl = hl + 1". Don't confuse the order of operands in ld. The first one is the one being modified. In Red ++, I see that TrainerPicPointer has been taken out, so I'm guessing that's why $5 became a $3. Does a comment like this really help you understand it better? I mean, fine if it does, but focusing on individual lines like this might only make things more confusing. Try to understand groups of lines together, since a simple one-line operation in a language like Python probably ends up as a common sequence of four or five lines in assembly. This is more the kind of comment I'd recommend. But be careful with names. "If wLinkState is not zero, go to .linkBattle". As I said before, "wTrainerClass holds the current trainer's class, but that starts at 1 not 0". The first entry in TrainerPicAndMoneyPointers is for Youngster, but YOUNGSTER == 1, not 0. Just like in Python, "arrays" start at 0. Because if hl = TrainerPicAndMoneyPointers and you want the first entry in that array, you don't need to add anything to hl. First, there is no "[dei]" shorthand. Second, as you can see, that "ld [de], a" is not followed by "inc de", because it's not necessary. First that code sets de to wTrainerPicPointer, and copies the next two bytes from hl to de. But then it sets de to wTrainerBaseMoney and copies the next to bytes from hl to this new de. Yes, as you can see by the "inc hl" instruction. This is a concept you would also need in C: pointers/addresses versus literal values. "hl" is a two-byte combined register that is often used to store an address, i.e. hl points to some location in memory. "[hl]" dereferences the pointer and reads the one-byte value at that address. In the code above, likely de is a pointer, and they want to store that poiner as a literal value at hl. The limited instruction set means they have to copy it one byte at a time. Macros are purely for typing convenience. If you replaced every instance of the add_pic macro with that equivalent code, the ROM would be exactly the same. You'd just be doing the macro preprocessor's job for it. Macros let you write a common pattern once and then keep reusing it. Compare that with functions: factoring repeated code into a function does save space, since you replace multiple identical blocks of code with a single "call MyFunction" operation. However, if I use the TrainerPics2 method, and if I hypothetically were to make sprites that were bigger than 2 banks, would I also the TrainerPics 3 label along with it? Would that cause problems along the way? Right. You just have to make sure that every trainer class's pic is accessed using the correct bank. For two or three banks, or even four, it's probably easiest to have the pics in order of trainer ID and get the right bank that way. Beyond that, you'll want to copy Mateo's method, so if you need help ask him. This is incorrect. You put "ld a, Bank(TrainerPics2)" right after "ld a, Bank(TrainerPics)" so it's just overwriting the old value. Your new code is going to try and load ever picture from Bank(TrainerPics2) instead of Bank(TrainerPics). So now the pics in TrainerPics2 will work but the ones in TrainerPics won't. It's just the opposite problem. I'm a bit confused as to how you thought it would work. Like, how do you imagine the code deciding which value to use? Now TrainerPics2 is working fine and TrainerPics1 is not, I'm guessing this has to do with the accumulator having two values at once. you've just overwritten 1 with 2 in a, not given it a new dual value. Now I'm having a little bit of trouble trying to write an if statement with a zero since checking if it's a link battle or not is using the z register already. It's funny, I'll occasionally see an error in your code and explain it, and then it turns out you already noticed and know what needs to be done next. • If [wLinkState] is nonzero, use Bank(RedPicFront). • Else if [wTrainerClass] is less than PROF_OAK, use Bank(TrainerPics). What's convenient here is that if [wLinkState] is nonzero, it doesn't matter what [wTrainerClass]. You don't have to have nested conditionals. but that mixes up checking the condition with doing the result, and relies on "ld a, Bank(RedPicFront)" not messing up the nz flag set by "and a". Also keep in mind that the notation "[hl]" or "(hl)" refers to the 8 bit value at the memory address pointed to by the 16 bit value in hl. Instructions like "add hl, bc" add the 16 bit value in bc to the 16 bit value in hl and stores the result in the 16 bit register pair hl. It is incorrect to use notation like "(hl) = bc + de" because "bc + de" is 16 bits, while "(hl)" is 8 bits. It does not decrement the result. It decrements the pointer hl. Then the byte at memory address $4321 gets loaded into a and that memory address doesn't change value. Then the value in hl gets decremented to become $4320. The reason this is done is so that you can quickly do 'ld a, [hl]' again to get the next sequential byte in memory without having to waste space with extra instructions for incrementing or decrementing the hl pointer. The end results of both of these pieces of code are identical, but the second assembly routine is 3 bytes shorter. Macros don't take up any more or less space than using strictly plain assembly instructions. Creating and using a macro simply gives you a quick and convenient way to do the same boring work over and over in your source code. It takes three arguments (\1, \2, and \3, the rgb values) and dumps a 16-bit value based on the three arguments you give it. You can see that both with and without the macro, the output rom is going to be identical, but it's much more handy to think of macros we can come up with that make dealing with the source code a little bit nicer.